getcalc.com's circle sector calculator is an online basic geometry tool to calculate area of sector & length of an arc (partial circumference length), in both US customary & metric (SI) units. Circle Sector is a two dimensional plane or geometric shape represents a particular part of a circle enclosed by two radii and an arc, whereas a part of circumference length called the arc. 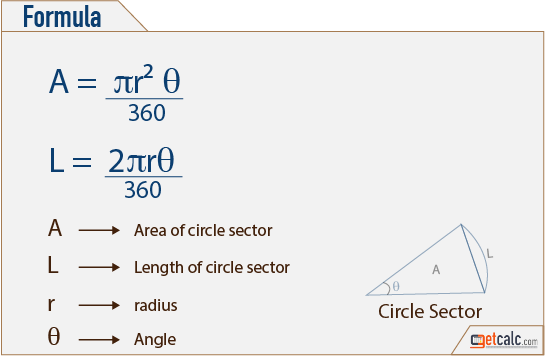 K-12 students may refer the below formulas of circle sector to know what are all the input parameters are being used to find the area and arc length of a circle sector. Below are the practice problems for grade school students, on finding what is the area and arc length of a circle sector. By click on the corresponding problem shows the step-by-step calculation or work with steps for how to find the area and arc length of a circle sector. For any other similar values, use this circle sector calculator to verify the results. Find what is the Arc length & Sector Area of circle whose radius is 56 inches and angle is 45 degrees? A circle sector has the length of 14 inches from its center in 60 degrees, find what is the area & arc length of a circle sector?